I had an idea to make a simple, and easy to use door opener with a geared motor a couple of years ago. At that time I did not have the knowledge to make a door opener. This winter break I felt optimistic and, gave it a shot. I am making this instructable, as simple ways to make this online, and all I found were complicated attempts at chicken coop openers. Since this is my first instructable, I might miss out some information, so you can leave your questions in the comments, and I will respond as promptly as I can. The point of this instructable is mainly to inspire you to do something similar, or to help you build yours. 5. A button, swicth, ir sensor etc. to tell when to open the door. 1. Dremel/ rotary tools- they are very usefull, and will also help in any other projects. based on my requirements I synthesised a flow chart. Since i did not have a mosfet, or a transistor that, can control high current, and voltage, I used a servo to press a mouse button. Then I programed in the arduino enviornment (My code will be available on the bottom or top of the page. At the time of the project, my programming was basic, so I found other peoples codes, and mixed them, added some of my code, and made up the final code. About 50% of the code is actually mine. I used 6 mm thick hobby plywood, and cut it with a dremel, and a reinforced cutting wheel. Capacitive sensor to pin 6,8 ( pin 8 is the sensor pin), ( I used a 4 M ohm ressistor), and remember for the capacitive sensor to work it should be connected to a proper ground. 2. go to sketch, and try manually adding the file. I also added a led to pin 13, as it already has a resistor, adding the resistors is completely optional. We are nearly done, now we just install the elctronics, and I ran Ground ( for the servo), power (connects to a usb wall adapter to power the arduino, and signal (for the servo). All of ypu will probaply modify your sketch, to suit the need of your location. Humidity, grounding can afect the sketch. so you should calibrate it to your needs. 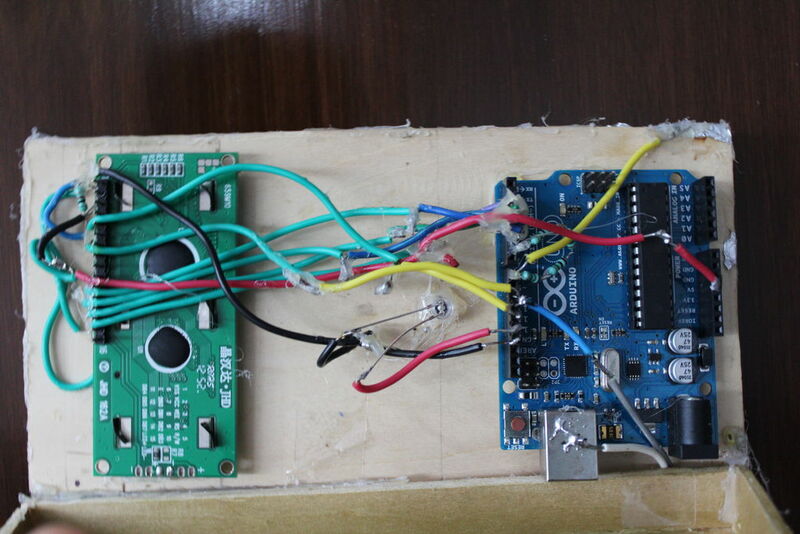 Depending on how well the arduino is connected to ground, and the size of your foil touch plate, you will have to adjust the sensitivity of the sensor. if(value > 40000) - adjust this line of code to get your desired results. I recommend you do this step now, as your circumstances will be the same, in the real world scenario. myservo.write(90); - adjust those lines to get your desired results. I suggest keeping one of the 2 lines at 90 degrees, as they are the servos neutral position. 3. Motor- depending on the motor RPM/ Wight of your door/ the output V,A of your PSU your motor might take more or less time to open the door. 2.using a raspberry pi, and a webcam to data log who opens the door, and uploading it to a webpage. 3.Hacking into the lock of the door, to remotely lock the door, or grant permission remotely using the webcam. You can use this code for your own projects, that is completely fine. The arduino control is the easy part. The mechanism required to open and close a door is the difficult part. You show nothing about how the mechanical part works making this instructable pretty much useless. Check out my instructable for a working mechanism! What do you mean a "servo to activate the door"? Are you referring to a servo motor? or what is it exactly, how did you connect it to the motor? And how did you control the motor? did you use any drivers? Sorry, I no longer have the motor I used, but it was a ~30mm 12V brushed, geared motor. Pretty simple, nothing fancy. Also, could you please elaborate on what questions you have about the sensor. It will help me give you a better, more appropriate response. any pictures or anything you could send me or post here?